That should do the trick, with two exceptions. First, if you reside in China you need to point your web browser towards https://console.cn.janrain.com. Second, if you’re using a custom login page (typically because you want to log on to Console using your corporate credentials), then you’ll need to point your web browser towards your custom URL. Note. The preceding illustration shows the default Console logon screen. The logon screen that you see could look slightly different, based on any customizations and modifications that your organization might have made. Note that your URL could different as well, depending on your setup and configuration. 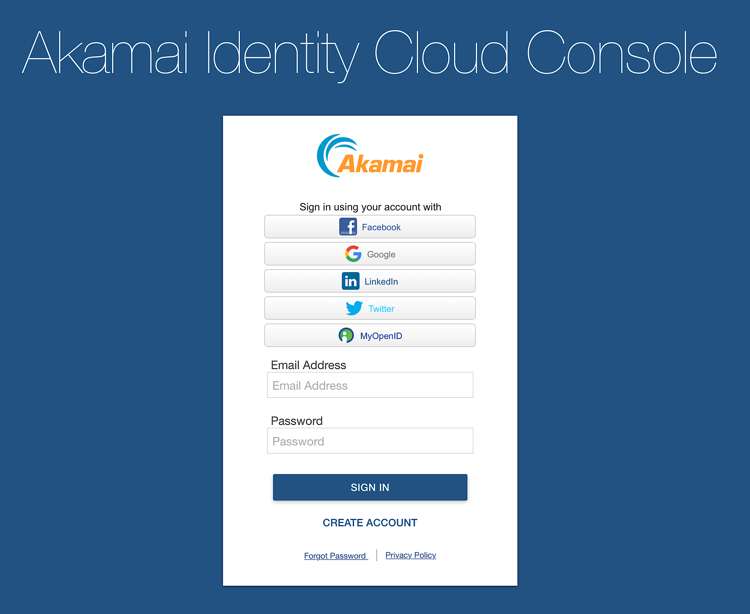 See your Akamai representative for more information. Note. After logging on to the Console you will automatically be logged out if: 1) 15 minutes have elapsed without you taking any action; or, 2) 8 hours have elapsed since you logged on, regardless of your activity level. So what happens if your session times out? Nothing much: you’ll be logged out, but you can immediately log back in.